A huge Fallout: New Vegas mod seven years in the making. This ambitious Fallout: New Vegas total conversion was, remarkably, seven years in the making. 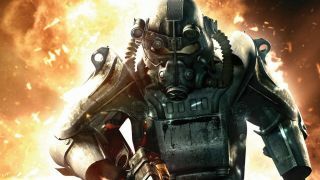 Developed by Rick Hukkanen and Brandan Lee, with the help of dozens of volunteers, the mod is set 20 years after the events of Fallout 2, making it much closer story-wise to the original Interplay series than the Bethesda/Obsidian games. It features new locations, 48 quests, full voice acting, and 13 endings. And best of all, it’s totally free. You can download New California from ModDB, and for most people, installing it is as simple as unzipping the contents into your game directory. Like any good Fallout game, it begins with a narrator lamenting that, yes, war never changes. Over newsreel footage of nuclear bomb tests a man gives a rousing speech, like some jingoistic military commander addressing his troops. But then we see that, in fact, he’s a ‘vault-ball’ coach getting his team ready for a big game. In the mod you play as a resident of Vault 18, which we learn is located high in California’s San Bernardino mountain range, and you just happen to be the Vault 18 Patriots’ star player. You’re a jock, basically, which is different from most vault dweller origin stories. One of the first choices you make is in the middle of a vault-ball match. A player charges at you, and how you deal with him dictates whether your character will be a soldier or scientist. This changes some things in the story ahead and offers two contrasting play styles, providing some replay value. It’s a brilliantly organic way of shaping your character, although you do get to set SPECIAL stats with the familiar Vigor Tester. There are a lot of alternate paths related to stats and speech checks in New California, so it’s worth thinking carefully about how you want to play it. The prologue takes place entirely in Vault 18, which is grander than some of the other shelters we’ve seen in the series. At its heart is a giant atrium from which each ‘district’ branches off – including a vault-ball stadium, admin offices, residential apartments and more. It’s a dramatic place, and you can spend more than hour here if you’re thorough, talking to fellow residents, completing quests and, of course, filling your pockets with junk. There are some fun low-stakes quests in the prologue designed to introduce the characters and set the mood, which is a nice way of drawing you into the setting. Exploring Vault 18, talking to the huge number of named, fully voiced characters, I forgot I was playing a fan-made mod. This is genuinely as good as anything in the main game, except for a few minor NPCs whose voices are clearly being performed by amateurs. The framerate also takes a massive hit in the atrium, but this is something the creators are aware of and will address in a future patch. The fact that something like this is even being patched at all is impressive, and shows how dedicated the devs are. There’s a lot more going on here in terms of environment size and clutter, so if you have an old PC you might run into some problems, even if New Vegas runs fine. Later, a violent civil war breaks out in Vault 18. A cell of Enclave calling itself the Patriots goes to war with the local security forces, and you end up trapped in the middle of it. It’s revealed that Bragg, the leader of the Enclave forces, is your vault-ball coach, and you can decide whether to join or fight against him. Whichever path you choose, the escape from Vault 18 plays out in a bunch of different ways. I sided with the Enclave the first time and was horrified to see them coldly butchering the people I’d gotten to know in the prologue. Then, when you leave the place behind, you find yourself in the dusty mountains of California during a golden sunset. The vault escape mission is well designed, although I did have problems with events not triggering and characters attacking me for seemingly no reason. I mean, as far as I know. There’s a lot of reactivity here, and I could have been wearing the clothes of a rival faction without realising. Even so, it’s much more entertaining than the similar introduction in Fallout 3, and I still occasionally had to pinch myself as a reminder that this was a mod I was playing. When you emerge from the vault you find yourself in a forested valley and make your way towards the town of Pinehaven, which is where your adventure in New California really gets going. Another war has broken out topside, this time between the Enclave and the New California Republic. You get a taste of this when you emerge from the vault and see explosions on the horizon and vertibirds fighting in the sky. Then, to make matters worse, you’re kidnapped by a gang of raiders and end up imprisoned in a cave network beneath their base populated by pale, creepy cannibals called the Voiceless. Their spokesman, Mevil, delights in the fact that you might be their next meal, forcing you to charm your way off the menu. Charisma, I came to discover, was an important stat to have in New California. In the space of a few hours you go from star vault-ball player to food for a tribe of cave-dwelling flesh-eaters. But like anything in Fallout, there are several ways to get out of the caves and get your revenge on your captors. I won’t go into too much detail, but my method of escape involved rallying a small army of Voiceless to help me defeat… something. Something big and scary and extremely unpleasant. There’s a lot of combat in New California, but also a huge number of speech checks depending on your actions, stats and other factors, which enhances the RPG side of the mod. There’s an enormous amount of variety in this thing. The missions, characters, locations and everything else feel hand-crafted and bespoke. It reuses some assets from New Vegas, naturally, but there are way more custom-made textures, models, and sounds here than I ever expected to see from a mod. To the point where calling this a mod, or even a total conversion, kinda feels like a disservice. It’s a game in its own right, and almost on par with Obsidian’s own expansions. But when one problem is solved in New California, another is waiting to take its place. A vertibird crash leaves you stranded in the desert, on the remains of an old highway, and you end up in the middle of another battle. This time you have a little help from an NCR ranger called Vargas, however, and spend some time with her fighting along the highway and dodging nuclear mortar shells. Bethesda’s creaky Fallout engine doesn’t handle these war scenes that well, but the design of the setpieces is pretty dramatic. The creators have squeezed some chaotic, cinematic stuff out of this old tech, even if the framerate judders under the weight of it all occasionally. If you survive the highway battle you’ll make it to another of the game’s big hubs, Union City. This isn’t quite as packed with stuff to do as the cities in the main Fallout games, but it’s an interesting enough place to explore. Later you’ll venture out into the wilderness and encounter a tribal community who live in ramshackle village called Xiabula. It has access to fresh water that Union City needs, and you have yet more options in how you get it for the city. There are more quests than most people will finish in New California, although I would have liked some more rewarding exploration. There isn’t much to find on the map if you stray away from the path set by the creators. New California is a remarkable achievement, and one of the most confident and professional mods I’ve ever played. I didn’t think I’d ever go back to the 3D Fallout games after playing them to death, but this made them exciting again. Longtime Fallout fans will also appreciate the attention to detail when it comes to the story, as this is arguably more respectful of the series’ lore than what Bethesda and even Obsidian came up with in their games. It isn’t canon, of course, but makes its own mark on the mythology in some interesting ways, particularly in exploring the motivations of the sinister Enclave.